Your college audition can determine the direction your life takes. No pressure there! "It is the start of many things," Danielle said of the college audition. For example, it determines who your teacher will be for the next four years, where you will live, whom you will meet as colleagues... But one should have some perspective on this important event: "Unlike other college interviews, where you prepare for that interview for maybe a year, doing a string audition is different. You've been preparing 10-12 years," Danielle said. "We are always preparing for this audition. That takes a little stress off the audition; in a way, it's just another performance." 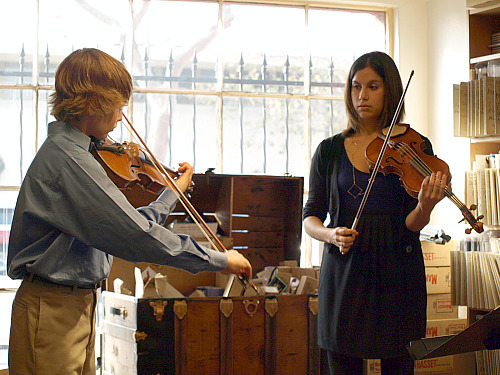 Last Saturday Danielle worked with four young violinists from the Los Angeles area; students of Elise Goodman, Alexander Treger and Gayaneh Kumar. 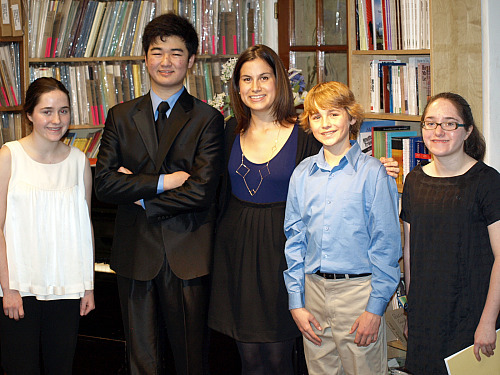 First was Cameron, age 13, who played the "Allemande" from Bach's Partita in D minor. Since he had the notes well in hand, Danielle focused on helping him with the more sophisticated issues of style and voicing in this piece. For example, the Allemande begins with the resonant open D paired with a fingered D on the G string – a "double D," if you will. "Lean on it, it sounds almost like you are apologizing for it," she said. (And as a matter of fact, that double D is not just some editor's cute idea; you can see it written in Bach's own hand if you look at the manuscript). The same holds true for the double E in m 17 – it's a lot of "E," but go with it, sink into it. When playing solo violin, "that allows you to play with more colors than you could play with piano accompaniment," Danielle said. With a concerto, "your color scheme gets a little narrowed because your main objective is to BE HEARD." With that in mind, how does one widen the color range? One can alternate between a floaty and focused sound (m. 6-7 – high notes floaty, Ging notes focused). Also, one can lean into beats (m. 11) to create a dance-like feeling. Also, for the chord at the end of the piece, keep the violin up (don't dip the fiddle to make the string crossing) and let the fingered fifths on the bottom settle in, using the whole weight of the arm. "Channel your inner fat man!" she advised the lean teen. For Alexzandra, 15, who played two movements from Handel's Sonata No. 4 (some may know this one as the fifth piece in Suzuki Book 6), Danielle advised using a wider range of vibrato. When asked to change to a narrower vibrato, Alexzandra was able to do so; now it was just a matter of actually using that range and not just defaulting to one kind of vibrato. 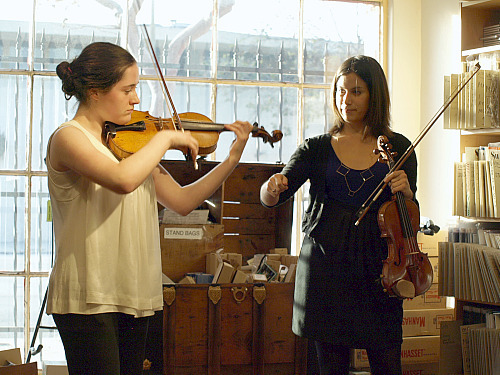 "You have good control over the speed of your vibrato, you should use that more when you are playing," Danielle told her. Also, it's important to remember, when vibrating on shorter notes (as in the Allegro movement), one has to make sure the vibrato does not go above the pitch. "You have to vibrate below the pitch and then land back on the pitch" before ending the note, Danielle said. When vibrating on a note at the end of the piece or the end of a phrase, "keep the vibrato going for a split second after you pull your bow off the string," Danielle said. "It sounds good, and it even looks good." Danielle also talked about coping with nerves. "You have to accept that you're going to be nervous. Your hands might shake; your body is going to react a certain way," Danielle said. "When it comes down to it, the more performing experience you can get, the better. Play in masterclasses, play in front of family. I personally still play for my family!" For Avery, 15, who played the first movement of the Wieniawski Violin Concerto No. 2, Danielle talked about communicating with the pianist while performing. Most college auditions are played with piano accompaniment, and it's important that this element comes together easily. "(The pianist) can't read your mind – it's you job to know those spots that are tricky ahead of time," Danielle said. "There were a few spots when you just left her in the dust – you could have salvaged those spots in a more sophisticated way. It's relatively easy to send the pianist a message." For example, an area with potential pitfalls in the Wieniawski first movement: when the piano has the melody and the violin is playing double-stop triplets, letters K-L (m 192-204). In the midst triplets against duplets, the pianist needs a few cues, but due to string crossings and a possible feeling of rhythmic displacement, one has to really practice giving the cue in the proper place. It may feel awkward to give the scroll a lift while doing a string crossing down four strings from the E to the G strings, but sometimes it's essential. As for the notorious fingered-octave run on the first page of the Wieniawski, "it's not as fast as you think," said Danielle (and a lot of us would benefit from that advise – attempting to play it too fast is very common). "I would take it 'a little slow and deliberate' over 'too fast and not able to hear it' any day," she said. Also, one can use the mental approach that one is just going to the F, the last note that requires a fingered shift. "That's your only goal, but you just happen to play two more notes than that." For the octave run, "it's important that your foundation be deliberate," Danielle said. In other words, don't just practice it fast and then wonder why you aren't making any progress or improvement. Take it apart, slow it down, play it successfully at a slow tempo. The video on long distance shift reminds me of one of my teachers who said to me that if you slide slowly, you can't miss the note. In a sense, shift is not that hard, but it just needs to be done slowly, and a lot. Also, my current teacher told me that I have to absolutely believe that I will hit the note; no matter how much I've practised, the moment I don't believe I can, I definitely won't hit the right note. So very true. Thanks Laurie for another wonderful blog!